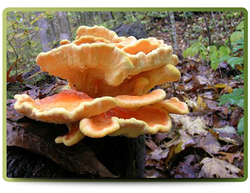 The Sulphur Shelf, Sulphur Polypore or Chicken of the woods has a very irregular shape. The cap is small and knob-shaped. The Sulphur Shelf mushroom gets its name from it's colour, which is sulphur yellow to bright orange, and grows out in shelves that can be from 5 to 60 centimeters in diameter and 4 centimeters thick. 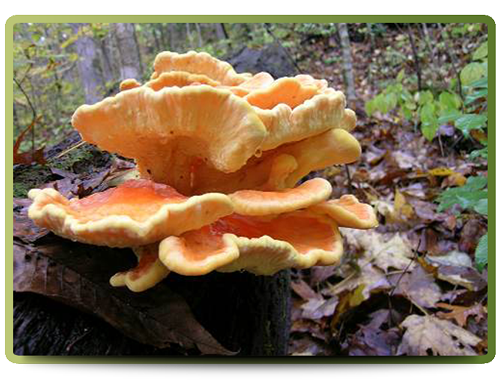 This mushroom grows in clusters on hardwoods and under conifers from August to October.